First off, by now you've figured that I was not a factor at all in my first berth to the National Handicapping Championship on January 23-25. My face was not plastered all over the Daily Racing Forum, an honor bestowed solely upon NHC XVI champion John O'Neil. It took me 28 races (of 30 through Friday and Saturday) just to get on the scoreboard, but that did nothing to deter what was a wonderful and valuable learning experience on several fronts. I was just outside the Top 20 of Sunday's consolation tournament with a few plays remaining, but could not connect on another winner; even if I did, I still would have fallen short, as the last two race winners were 2-to-5 and 6-to-5 and would not have produced enough winnings to finish even 20th. Rewind to Thursday evening, however. After an uneventful flight from JFK on which I handicapped the 8 mandatory races for Friday the night before the contest, I was unlucky enough to be assigned a taxi driver who conned me into being "long-hauled" via the Interstate to host site Treasure Island at twice the normal cab fare. Ominously, we hit some traffic at the scene of a nasty car accident, where a deceased person lay covered by a blanket in the fast lane of the interstate a good 10 yards past a half-dozen police on the scene. The poor person could not have been left more out in the open. It was a surreal experience for me, and all I could do was say a prayer for that person as we passed the accident scene. As we're pulling into Treasure Island, the accented cab driver insisted I tell an approaching police officer that I asked him to deliver me by interstate. The officer, however, made clear that I had been taken, told me to call the cab company for reimbursement (since received), and next time to ask any Vegas taxi driver to be returned to the airport by the most direct route. Pretty interesting first 15 minutes in Las Vegas, eh?! Anyway, I'll get more into my awful contest performance in a subsequent post, since I am still gathering my thoughts about that personal aspect of the trip. At this time, I would rather focus on the positives, of which there were several. The NTRA provides an outstanding experience, in my opinion. From the point of contest check-in through the Sunday evening banquet that concludes the 3-day NHC, service was top notch. Tournament staff in the ballroom were extremely visible and accessible to players. Contest betting terminals were readily available, with barely a wait to make a contest play. The continental breakfast and lunch spreads were high-quality, and the main ballroom offered enough room for players to operate and mingle. In short, the atmosphere was extremely conducive to thoroughbred handicapping contest play. The piece that I relished the most, however, was bonding with some wonderful individuals and handicappers from around the U.S.
Now, by coincidence, 3 of the 7 players at my table were fellow New Jersey residents -- proof once again that one never truly escapes the Garden State. Two seats to my right -- Peter Pruzinsky of Wayne, another NHC first-timer, whom I had met a few weeks prior through mutual friend Paul Zerbst at Monmouth SSC#1. Two seats to my left -- Josh Kamis of East Brunswick, in his second trip to NHC and a qualifier through DerbyWars.com. In between were Kenny Shaw of Illinois, Bill McKinney of Pennsylvania, Eliot Honaker of Louisville, KY and Bob Schintzius, fresh off 8 feet of snow at his Buffalo, NY-area home. Meanwhile, two random encounters warmed my heart. About mid-afternoon on Friday, a fine gentleman sauntered over to my table to introduce himself as a big fan of the NJ Horseplayer blog. No, Dan Camoro, who stumbled upon my blog from his Oregon home. Dan was even more brave than I could ever imagine, not only having the courage to walk up to a complete stranger, but wagering $10 of his hard-earned dollars on "B Holobowski" to win the NHC! Not the soundest investment, but hey, nothing wrong with blind faith! We struck up a wonderful conversation that afternoon and in the days after, and I even met Dan's wonderful daughter, a very artistic young lady much like my daughter. Perhaps it's time to expand the operation to ORHorseplayer.com. Meanwhile, I finally got to connect with Damian Sasso, a great young man from Rutherford, NJ, who when all was said and done took home $6,500 for a third-place finish in Sunday's consolation tourney. Damian (and his wife) allege to be NJHorseplayer.com readers as well, so go figure. Unfortunately I did not connect with some other folks who read my blog and that I had hoped to meet, but admittedly got a little bit lost in the business at hand -- trying to win what is an exceedingly difficult handicapping contest. The aforementioned Kenny Shaw came closest of our table, taking home nearly $20,000 for 17th-place finish in the "Final 50" and a few noses or head-bob away from legitimately making the final table and having a shot at the top $800,000 prize won convincingly by Mr. O'Neil. I felt really guilty on Sunday at the conclusion of the consolation bracket because my lone winner of the entire tournament, 10.6-to-1 Jilleah, nosed former NJ-owned (Kenwood Stables) Raro in a 7.5-furlong turf race at Gulfstream Park. A win by 4-to-1 Raro would have improved Kenny's Top 50 tournament standing, and by that point one thing I learned from my first NHC experience is that once out of the running to win NHC, players will live vicariously through hopefuls with a real shot at winning the whole tournament. Kenny played the entire tournament like a champ, yet came out on the short side of at least 2-3 photo finishes and collected only place money rather than win-place. Overall, however, with each person's selection came a "good luck," or a "great call" congratulatory remark whenever someone at the table hit a race. I found the atmosphere extremely supportive and really appreciated the moral support of my playing partners, especially after some really bad selections on Saturday morning. In sum, what impressed me the most were the players and the quality of the contestants as people. On the return flight home into the impending blizzard last Monday, I had the time to read all of the bios of each of the hundreds of NHC players, compiled in a book given to all qualifiers. Mark Aylward, Waxhaw, NC, on his most memorable horse racing experience: "...taking my dad to Saratoga for his last trip before he passed. It was just so special to go one last time with him." Greg Bone, Dallas, TX, on his proudest accomplishment: "I'm constantly amazed and thankful for all the great people in my life -- family, friends, colleagues. I don't know that I can claim it an accomplishment, but I've certainly been very lucky." Francis Boustany, Lafayette, LA, on his most memorable racing experience: "In 1998, my dad was terminally ill and I decided to claim a horse, Foreign Pass. He was a huge fan of horse racing, so I knew I could try to boost his spirits and tell him that he needed to get out of the hospital so he could go to the racetrack and watch the horse. He passed October of 1998, and the first race with Foreign Pass, I looked up to the sky and said "Dad, ride Foreign Pass today!" Not only did the horse win the race, but he also set a track record at Fair Grounds for the 5 furlong distance. He ultimately went on to become claimer of the meet." Steve Decaspers, Forest Park, IL, on his proudest accomplishment: "When my four-year-old nephew Jacob needed to have a bone-marrow transplant, I led a fund-raising effort to support his family and cover their expenses during a full-time, year-long journey. I'm proud to say that Jacob is 11 now and healthier than he's ever been." Frank Scatoni, literary agent from Del Mar, CA, on his proudest accomplishment: "I'm a big advocate of literacy, and I think it's important for everyone to try and contribute -- in their own way --- to the cultural landscape of our society. I'm extremely proud of the fact that I've worked on books that not only have entertained but, more importantly, have also affected change, helping people open their minds and view the world in different ways." Larry Burns, Voorhees, NJ, on his most unique experience: "...or should I say my most frightening experience, happened in February 2005 when I was carjacked, held hostage for over two hours, & eventually shot four times by my assailants and left to die on the NJ Turnpike. 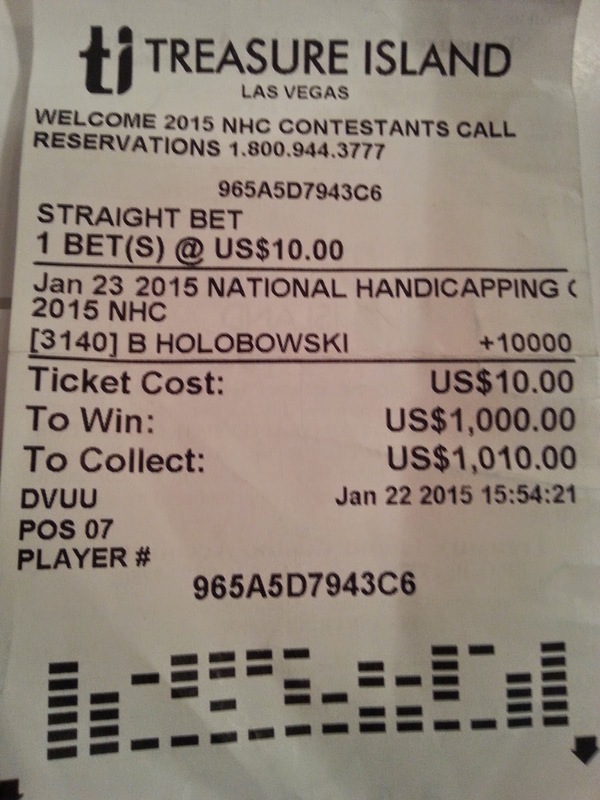 Miraculously I survived that horrific night, and now I'm coming to Vegas to hopefully win the 2015 NHC." These are the types of individuals and stories that the thoroughbred racing industry need to promote, and ones that make me feel extremely proud to have competed in such classy company at NHC XVI. 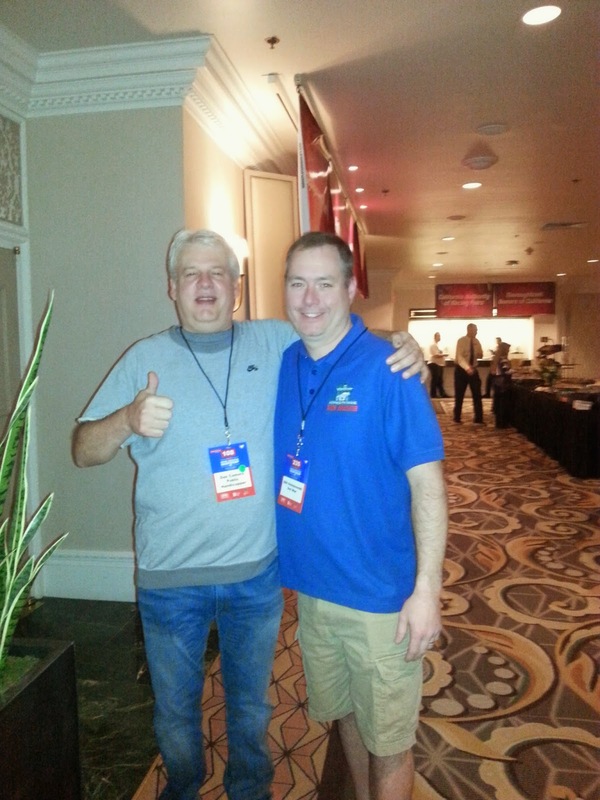 Next up...a far less-rosy endeavor: the unhappy recap of my handicapping at NHC XVI.